U.S. Army veteran Patricia Jackson came to Southern Illinois University Edwardsville’s Veterans Upward Bound VetMATCH College and Career Fair on Thursday, Aug. 9, with the hopes of finishing what she started years ago. Jackson was one of many veterans who turned out for the College and Career Fair in the Multipurpose Room, Building D of the East St. Louis Higher Education Campus. 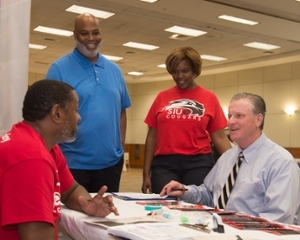 “We were excited to have been able to present career options for higher wages, college information, employers looking for workers, and other resources and services available for veterans – all at no cost,” said Johanna Wharton, director of Workforce Development and Strategic Partnerships, with the SIUE East St. Louis Center. Robert Burkes, of Madison, who served in the U.S. Army from 1993-97, also had his sights on obtaining information as to how he could complete his SIUE degree. “We have a sales position open and several mechanic positions open,” said Matt Maloney, territory sales manager for Ad Lift Truck. “We’re handing out applications today, and applications are also available online at adlifttruck.com. For Joe Brown, staff member at Lewis & Clark’s Veterans Services, veterans are the population that he wants to assist. Veterans Upward Bound is a TRIO grant program funded by the U.S. Department of Education. With a focus on empowering people and strengthening communities, the SIUE East St. Louis Center is dedicated to improving the lives of families and individuals - from pre-school through adult - in the Metro East. Head Start/Early Head Start and a charter high school are among the programs that offer the community renewed hope and an opportunity to reach educational, career and life goals. The Center also assigns first priority to encouraging, supporting and improving the educational success of the residents of East St. Louis and surrounding urban communities. The Center provides comprehensive programs, services and training in the areas of education, health, social services and the arts. Shown at SIUE East St. Louis Center’s Veteran Upward Bound (VUB) VetMATCH College and Career Fair (L-R) are VUB staff members Carlton McGee, Todd Gilyard and Johanna Wharton, with Billy Nunnery, veteran and VUB participant.